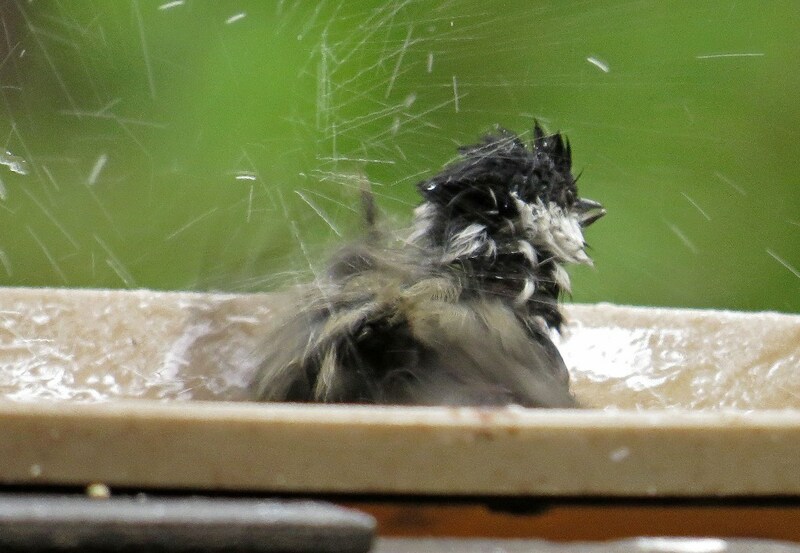 I started to title this post “bathing chick” for short…but then thought better of it! Although I do have to smile at the thought of disappointing those who might have googled merely to ogle. 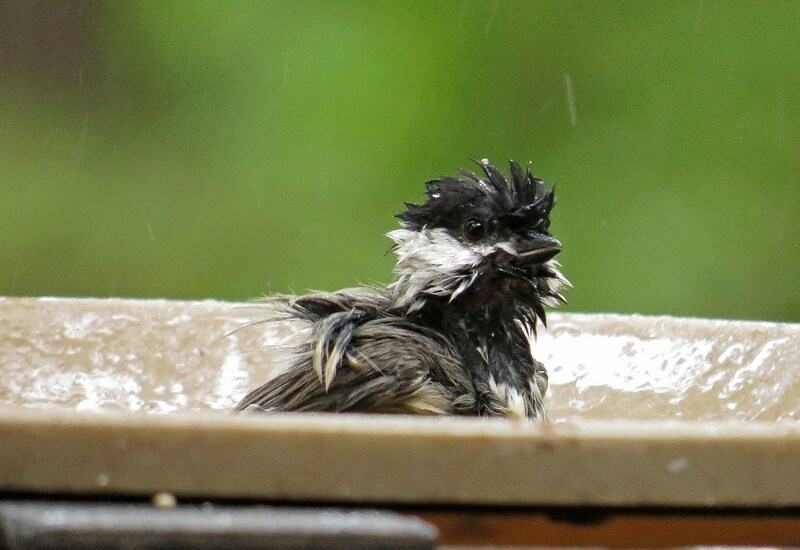 At any rate, here are a couple photos of a Carolina Chickadee splashing about in a water dish on my deck. To me, he is a picture of pure, uninhibited pleasure. You can’t help but smile (and fight off a bit of envy) when you watch him. This entry was posted in Bathing Beauties and tagged bird photography, bird watching, birds, chickadee, nature, photography, wildlife. Bookmark the permalink. Hilarious! 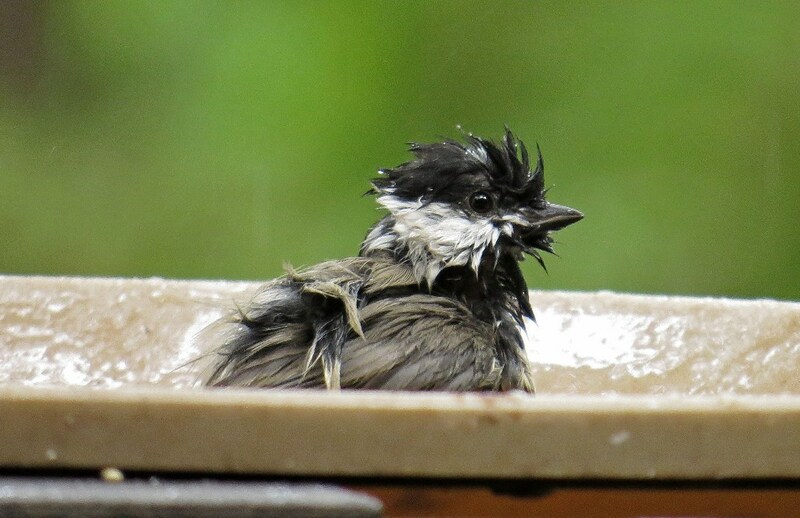 I’ve actually never seen the chickadees here use the bird bath. The robins bathe every day, sometimes several times. Maybe the chickadees like a little more privacy. Thats a great series of photos! What kind of bird bath do you have? Hello! Thanks for stopping in. The bird bath in the picture is a shallow, round deck mounted bird dish. But, I have a bit of an addiction, so I will go ahead and confess that I have 8 different places the birds can drink or bathe, plus a mister. I think I must have hoarding issues! Haha! Do you end up with a lot more birds that way? I’ve been thinking about putting a bird bath in our yard too. Love this! Pinned onto “Simply Fun”.